The ENVIROMUX-MINI-LXO features 2 temperature/humidity ports, 5 digital inputs, and 1 output relay for control of external devices. Linux inside. Also known as: Remote Server Environment Monitoring System, monitor network closet, data center thermometer, temperature humidity IP sensor reading, computer rooms temperature alert, tcp/ip temp probe. The ENVIROMUX® Mini Server Environment Monitoring System monitors critical environmental conditions (such as temperature, humidity, and water leakage) that could destroy network components in your server room. When a sensor goes out of range of a configurable threshold, the system will notify you via email, SNMP traps, web-page alerts, a visual indicator (red LED), voice phone calls (via Automatic Voice Dialer System), and SMS messages (via USB 3G modem). ENVIROMUX-MINI-LXO: 32 to 104°F (0 to 40°C). ENVIROMUX-MINI-LXO-IND: 32 to 167°F (0 to 75°C). Card reader or keypad must have output relays that will activate on desired events, such as failed entry, successful entry, forced entry, etc. Connect output relays to the ENVIROMUX-MINI-LXO digital inputs. Access the web interface to configure IP camera and alert settings. Under Monitoring > IP Cameras, select "Configure IP Cameras" to add desired IP camera address. 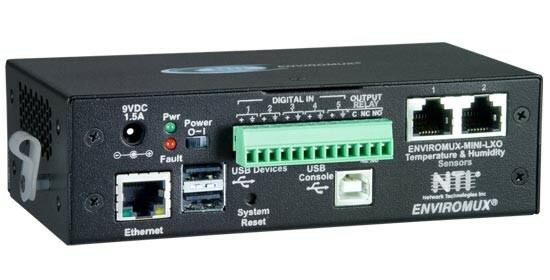 Select Digital Input > Digital Input Configuration and choose the corresponding output relay connections. Set-up appropriate alert settings and ensure that "Enable E-mail Alerts" and "Attach IP camera capture to email" are checked and the desired IP camera is selected; for example, if digital input #1 is normally-open, an email alert and IP camera snapshot should trigger if it is closed. Check that all user and email alert settings are correct. "The ENVIROMUX-MINI-LXO provides much more functionality over the old ENVIROMUX-MINI. We are happy with the NTI products that we have in place. I have run through the configuration pages and have noticed an improvement over the older unit in the look and feel of the interface. Although we don’t have a use right now, having two thresholds could be useful for us in the future." "Thank you for the quick delivery of the product. We purchased the ENVIROMUX-MINI-LXO to monitor the temperature in our rack room. It was simple to install. A few months ago the air for this part of our building came down, but luckily someone was at the location. Now we will be alerted if the problem occurs again by the ENVIROMUX system. In the future, we plan to purchase more sensors for this." "We have been using the ENVIROMUX-MINI unit for over a year now. Recently we had the opportunity to use an ENVIROMUX-MINI-LX. The ENVIROMUX-MINI-LX is a wonderful and easy to use environmental monitoring unit. The user interface provided is rather intuitive and makes monitoring our server room environment easier on us. I was able to set up the ENVIROMUX-MINI-LX in less than half an hour and was able to start monitoring the server room remotely using the web interface. The ENVIROMUX-MINI-LX knocks the socks off the original ENVIROMUX-MINI."